Gun Glory Glory is a not- for profit Shooting academy based out in Pune. We have taken huge strides in promoting the sport of Shooting to the Public and nourish the future Olympians. The academy is a year old and has already produced 4 Olympians competing at the 2012 london Olympics. The academy has decided to develop the sport through grass roots development. 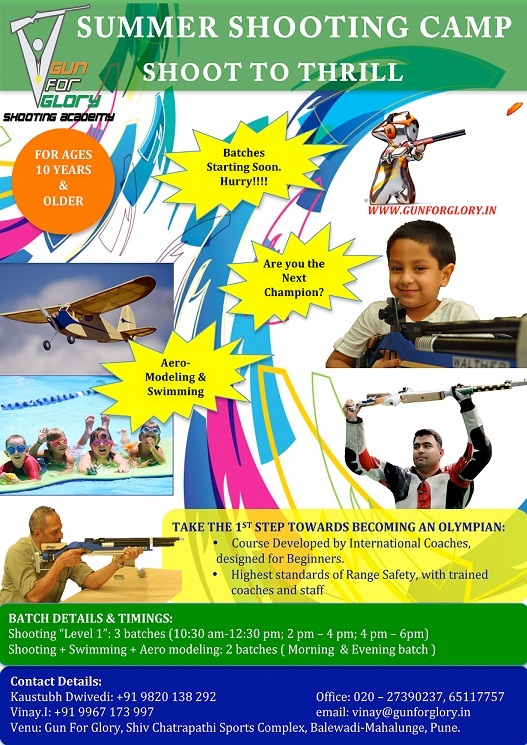 The shooting course offered is India's 1st certified beginners course and is a course developed by international Coaches. We also offering Indian 1st Shooting Summer camp, were kids above the age of 10 can be certified with our level 1 course "First Shot". We tend to reach out to the whole city of pune and produce the future Olympians at Gun for Glory.